Pabst Blue Ribbon: Beer of choice for the hipster crowd. It's cheap, going for $1-2 a bottle on special at Chicago bars. But did you know that PBR has a fancy cousin? 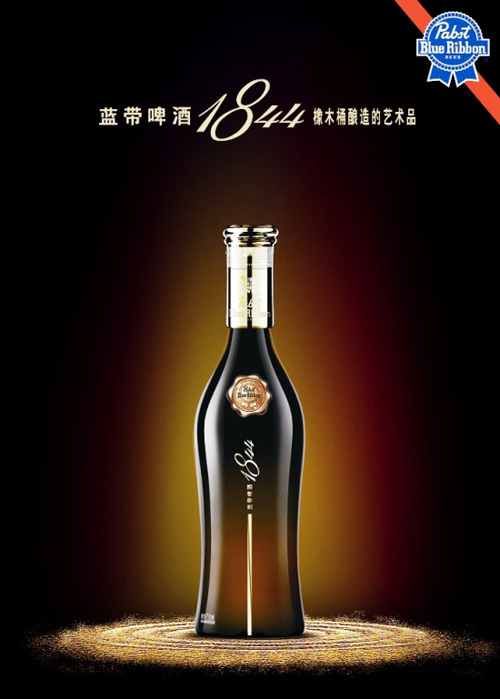 Blue Ribbon 1844 is being sold in China as a premium brew, going for $44 a bottle. Ads extol the beer's status as a "heritage classic breakthrough" and "a piece of art." Yes, the brewery says it's a different recipe than your average American PBR - but all the beautiful advertising the world would have a difficult time convincing any Chicagoan to pay an extra $40 for what they know as cheap beer. You're not kidding about the art part. I've never seen a bottle of booze that was so elegant.